Hello darlings! Did you enjoy your weekend? Ours was a quiet weekend, which is always a nice weekend at our house. LO has some sniffles, so we didn't got to the pool like planned. Instead, we tried to use our new gym membership which included daycare services. Our workout didn't last long, however, because after 10 minutes we got a call saying that she hadn't stopped crying since we left her in their care. It's going to take time for her to get adjusted to the new surroundings, which means each subsequent workout is going to be 5 minutes longer. Hopefully by the end of the month I'll get a full hour workout! Today's polish is a white crelly based glitter that allowed me to knock to untrieds in one shot. I started with a layer of Sally Hansen Xtreme Wear White On, a white cream proported to be one of the best drugstore whites out there. I'm always looking for a good white, and I was not let down by this one at all. I used only one full coverage coat and I had no issues with streaking. Perfect! For the star of the show, I used two coats of Liguid Glam Lucky Charm, aptly named for its colorful squares of turquoise, hot pink, and yellow glitters that mimic a certain cereal. In retrospect, I could have used one coat of Lucky Charm and gotten a similar effect but without as much crowding of glitters. Application itself was a cakewalk, with no issues with dragging or stacking of the adorable squares. I finished this with a layer of topcoat for shine. I really love the fanciful mix of glitters, especially considering that they're square glitters. I have used a white base in a long time either, and the bright colors really pop against the blank canvas. Although I think one coat would have been enough, I can't help not regretting the two coats because it's so much fun to apply the square glitters. Liquid Glam certainly has created a polish that is addictive to use and addictive to stare upon, which makes it worth every penny IMO. This polish is still available in the storefront, and features a 5 free formula and free shipping every day. Score! 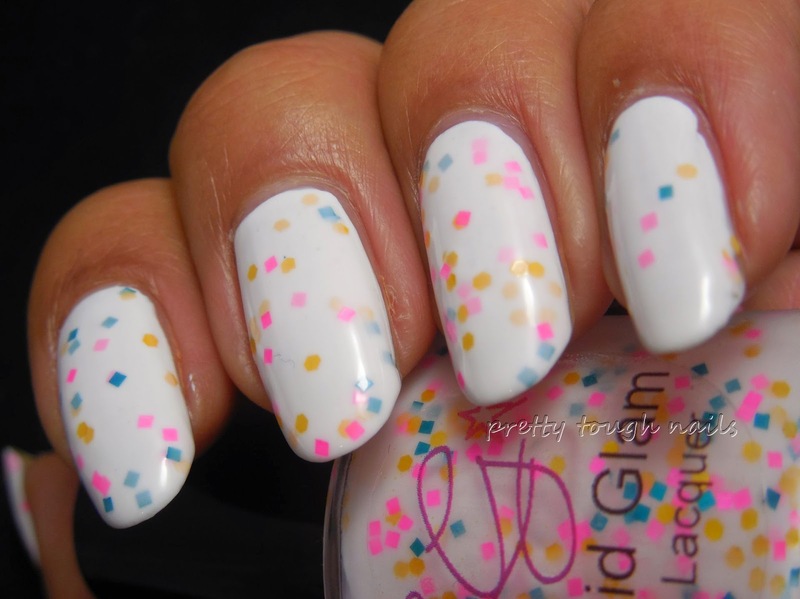 This is such a cute polish! 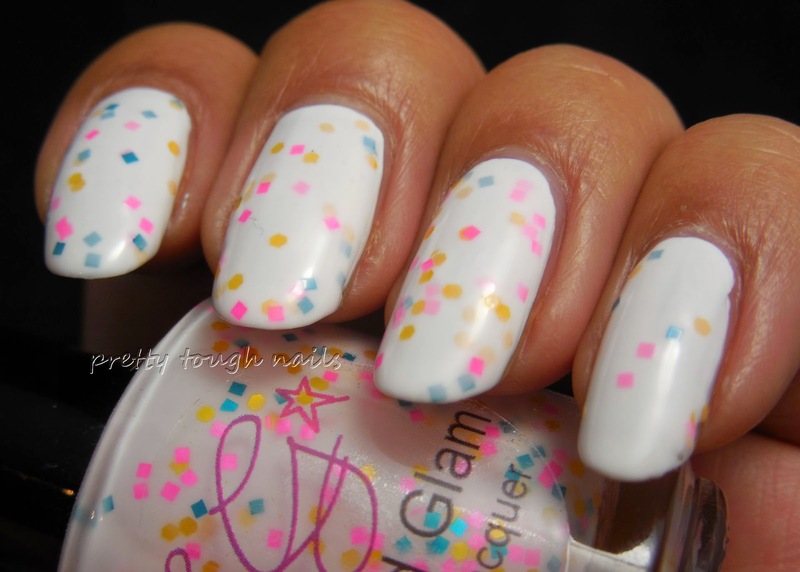 I adore the glitter mix in the white base. Thanks! 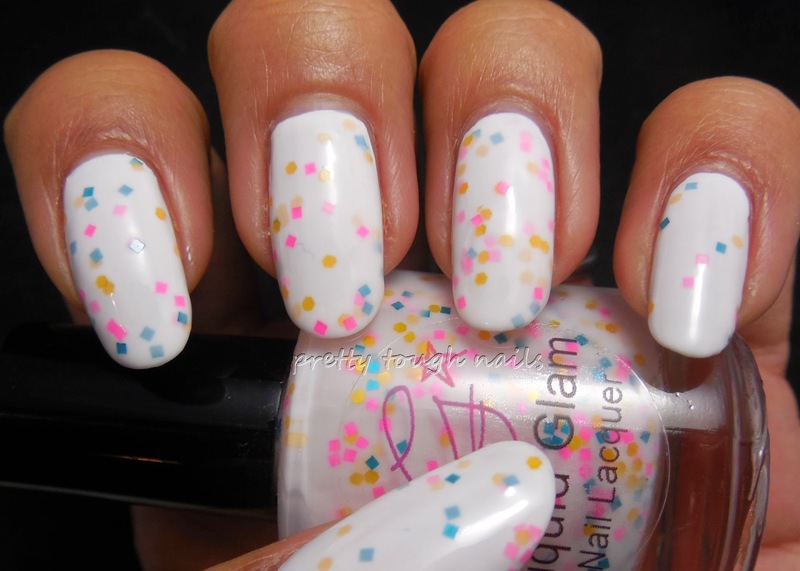 I need to try out some more white based polishes soon!